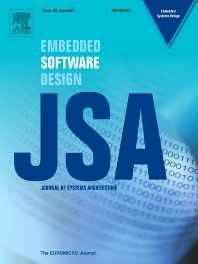 The Journal of Systems Architecture: Embedded Software Design (JSA) is a journal covering all design and architectural aspects related to embedded systems and software. It ranges from the microarchitecture level via the system software level up to the application-specific architecture level. Aspects such as real-time systems, operating systems, FPGA programming, programming languages, communications (limited to analysis and the software stack), mobile systems, parallel and distributed architectures as well as additional subjects in the computer and system architecture area will fall within the scope of this journal. Technology will not be a main focus, but its use and relevance to particular designs will be. Case studies are welcome but must contribute more than just a design for a particular piece of software. Design automation of such systems including methodologies, techniques and tools for their design as well as novel designs of software components fall within the scope of this journal. Novel applications that use embedded systems are also central in this journal. While hardware is not a part of this journal hardware/software co-design methods that consider interplay between software and hardware components with and emphasis on software are also relevant here.